At a recent Scrum Coaching retreat our group was struggling to turn a lot of words generated in a group environment into something concise and meaningful. Get many agile coaches together and you get a lot of competing and wordy viewpoints! Step forward what I am now calling the “group verbosity alignment” technique. For a topic allow all present to articulate what it means to them. Write this down on post it notes. Then get all present to pick their three favourite words from post it notes that are NOT their own. Draw up all of the highlighted words on a flip chart. Then create a sentence that includes as many words as possible, adding grammar and punctuation as required. A great technique to get everyone’s viewpoint together and focussed! I work with many clients trying to embrace Agility by adopting one of the popular Agile frameworks (e.g. Scrum). Remember there is a big difference between “doing” Agile and “being” Agile and a lot of businesses think that because they are “doing” Agile (e.g. Scrum) that they “are” Agile (when they are patently not). However that is for another blog post. In Scrum there are only three roles – the Scrum Master, the Product Owner and The Team – and while most clients I work with are happy with the first two, they have difficulty with the last – the Team. The Scrum objective of a true cross-functional/multi-disciplined Team with all capabilities required to deliver is a nice one but something that takes time and massive culture change (excepting, maybe, those start-up’s who embrace the concept from the start). Inevitably The Team is a collection of individuals brought together but who are on separate journeys through their differing professional lives. Some Team members embrace the concept of one Team and work, within their supporting organization, to achieve this. However the majority of organizations, and sometimes the individuals within, find this journey difficult to make. People within organizations are usually structured along clearly defined (and progression incentivized) role hierarchies (Junior Developer, Developer, Senior Developer, Principal Developer, etc. – for Developer substitute Tester, BA, Architect, or whatever role title you prefer). To propose that The Team members cross-skill across other roles is often meet with bewilderment, concern and often resistance. Individuals themselves are usually comfortable working within one delineated role, and feel uncomfortable spreading themselves further. “Not my area, see so and so” is a popular refrain. While this is fine, and can be managed, as part of the transformation journey towards Agile, it should not detract from the One Team focus at the heart of Scrum. Getting people together as a Team is the first step to creating a Team. Once you have a Team there is the chance of the other Scrum Team requisites following. All too often I hear people say they are not partaking in a particular ceremony or Team discussion as it is “not for me”. Developers avoiding design and research sessions, BA’s refusing to attend test sessions, Architects not attending Sprint Planning – these are all examples of where the gravity of the “Home” role over-rides the One Team ethic. The inevitable result is internal knowledge differences between Team members, internal Team strife and no velocity improvement across sprints. Insist that the whole Team is together for every session from the start. It may take time to become a true multi-disciplined and cross-functional Team but the first step is to act like a Team. All ceremonies in Scrum are for All Team members. Success depends on the success of the Team, not the individual. Make sure the Team, the whole Team, and nothing but the Team is always, always There. There are some Agile Teams I have witnessed where a “Sprint Velocity” metric is used as an “input” to the Agile process. This is particularly manifest when third-party development teams are involved, where the Velocity concept is used as some sort of “budget” against which a customer can “purchase” their Product Backlog items. This might give a clean “pound-per-point” contract position but does go against the Agile manifesto (“customer collaboration over contract negotiation…..”). Other teams I’ve observed follow a similar concept and use Velocity as some sort of capacity limit – filling the Sprint Backlog with Stories (and Story Points) up to – but not over – the Velocity figure. Even more surprising I’ve also witnessed teams (few, it must be said) that estimate the stories as part of Sprint Planning and – surprise surprise – the total number of Story Points for the Sprint matches the team Velocity (there is a reason why tools like Jira do not allow estimates to be applied after a sprint has started). How is velocity expected to increase in these kind of environments? At best it will remain constant, but normally it will embark on a downwards trend. For me, Velocity is an output from the Agile process and not an input (to). Velocity is not something that you can control or indeed something to be used as a control. It simply gives a current reflection on the performance of the team. It will fluctuate and change over time but it is key that it follows a generally upwards trend. Treat velocity with respect and use it wisely. One of the key reasons I like Agile and Scrum is the fact-based approach to forward planning. The team who actually deliver the work, estimate the work. The same team then deliver that work to the best of their ability – delivering a (hopefully) increasing velocity figure. That velocity figure can then help with visualizing how long the Product Backlog, in whole or in part, can be delivered based on current velocity. This is fact-based Release Planning and is more accurate than any other guesswork. Key takeaways: Velocity is an output, not an input. Velocity should exist in an environment which encourages it to increase. Velocity is a fact that can be applied to more accurate forward planning. DevOps does not mean employing “super admins” (despite what the recruitment agencies may say!) 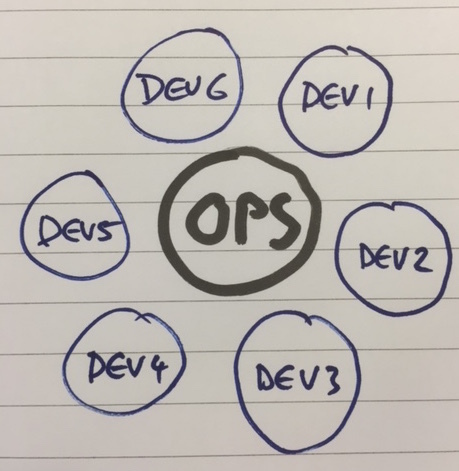 DevOps also does not mean building another silo (the “DevOps Team”) alongside other silos – although a DevOps team done right can be a catalyst for change. 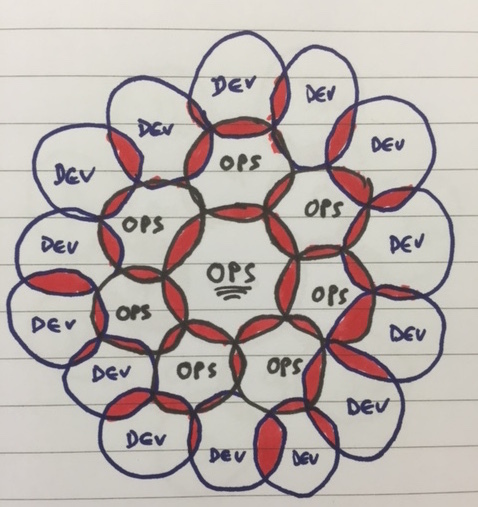 DevOps isn’t about throwing Dev and Ops together (like throwing two atoms together the reaction is somewhat nuclear in nature!). What DevOps does mean is cultural and organisational transformation, underpinned by appropriate automation. Yes – you may have heard this all before but how do you go about doing this if you are not a start-up? And how do you do it at scale? Well the catalyst for this is a good DevOps Coach, preferably someone Agile, but also with a strong business, as well as technical, skill-set. But then what do you do next? 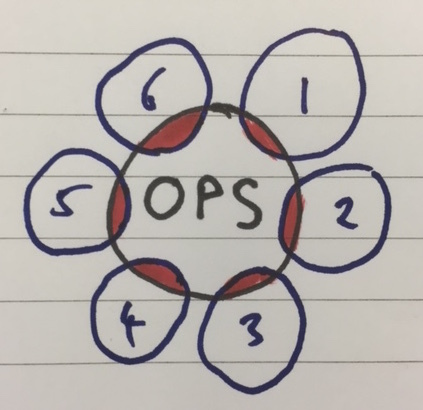 This is the typical silo formation that the DevOps movement was formed to alleviate, and there is chapter and verse elsewhere on the web as to the problems with this. “But this wont scale!” I often hear. The Ops team feel swamped by all of the requests from the Development “petals”. Ops may not have the capacity to support this model in the short term but the worse thing you can do is remove the petals (“they love me, Not!”). Instead the flower should be allowed to “grow” into something more cohesive with previously disparate Development and Operations teams pulling together a structure to improve overall delivery flow. Natural selection is the order of the day here, with individuals from Development and Operations (and ALL functions of operations too – Security, DBA, Audit, etc.) forming cohesive teams based on their current point in the delivery lifecycle and with business aligned goals. This is all augmented through a common sense of purpose and compliance with central standards (the double underlined “stigma” in the flower below – quite an appropriate word!). But what is the glue that binds all this together? A cross team Scrum-of-Scrums with a focus on DevOps is a good example. A DevOps community or “guild” is another. Even some of the Agile-at-scale concepts can be applied. Improved communication is the key however – every touch-point in our flower is a new group of communicating individuals who have aligned to address the businesses objectives. 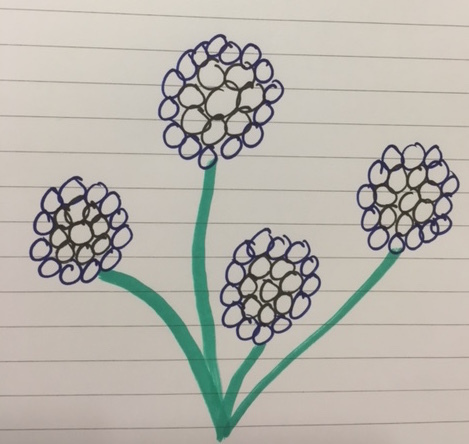 In my next blog I will write about some of the “bees” that flutter across these flowers within organisations than can cross-pollinate new ideas and solutions but that sometimes can also cause the flowers to wither and die….. watch this space…. Its been some times since I put down some feedback on the Tech Radar, of which I am an avid and enthusiastic supporter. However the January 2015 edition has a few gems which I want to replay. I’ve worked in the Agile + DevOps (= continuous delivery!) space almost exclusively since 2012 and so many organizations have tried to break down the silos between Development and Operations by establishing a separate DevOps team. Queue yet another silo! This is something that I’ve advised organizations against since the start so it is interesting to hear “Separate DevOps Team” as something the Tech Radar suggests should be a “hold”. At last! I’ve also worked with multi-team i.e. large scale Agile/Scrum teams, both in the public and the private sector, and the SAFe framework did not quite resonate. There are a few elements that are definitely worth adopting – a cross-team Scrum of Scrums, the concept of a release/deploy “train” and program-level (multi-epic?) collaboration. However SAFe left me cold when it again suggested a separate DevOps function. No surprise to see that SAFe is also in the “hold” category. On the flip side it is great to see MTTR (mean time to recovery) as a metric that businesses should adopt – and focus on. Once this has the management focus it deserves then businesses begin to propagate a culture of reliability, pulling investment focus in cloud, tooling and processes in areas like APM (application performance management) towards an MTTR of zero. Organizational dynamics are also a rich vein of gold, and only recently I’ve tried to focus a UK major government agency away from the trap that is Conway’s Law. Like many organizations they talked the talk around Digital, Agile and new ways-of-working, but didn’t walk-the-walk. I didn’t realize there was a formal name for the work I’d been doing but the “inverse Conway maneuver” encapsulates it well (a “trial” on the Tech Radar). Hand-baking of cloud infrastructure seems to have a magnetic allure for a lot of people. Maybe it’s the thought of being at the “cutting edge” but for me it is all about focus. Turnkey Dev, test and other environments before production should be the norm, and Digital Ocean (“trial”) is a good example. Instant developer productivity, with the tools they are familiar with, and which uses the same infrastructure-as-code capabilities that production ready cloud providers use, provides that seamless, and more cost effective, delivery/deployment train I described earlier. Heck it even uses SSD! I’ll gloss over the pushing of GO, for obvious reasons, and focus only on Xamarin. Re-use of code across multi-platforms has been a dream for as long as I have worked in IT (remember 4GL’s?). Add to this the “mobile first” ambitions of modern “Digital”, along with the gradual migration from Microsoft to other platforms (!) and you have a lot of businesses with a lot of C#…. Cue Xamarin with its ability to use C# code across multiple, modern, platforms – yes, even the iPhone. My old friend James Tuck is doing a sterling job pushing this and this is reflected in the Tech Radar rating of “trial”. I’ll focus on Django REST. I’ve loved REST since my days at Sage architecting (and promoting) the SData RESTful framework. Fast forward a few years and cue the modern API-first, Microservices-led revolution, but with better security (OAuth out-of-the box), taking place and you will soon be led to Django REST. You just wait and see. In less politically correct times the adage was a “bad workman blames his tools”. As a one-time apprentice mechanical engineer (failed!) I heard this a lot. However in recent times I’ve been wanting to use this put-down a lot when hearing people talk about their technology tools. “Ah, man, Jenkins is broke again”, “Damn it, the Puppet run failed”, “Holy cow, Git hasn’t got my source code”. If you are reading this, and none of this resonates, then you are reading the wrong blog! Seriously, we need to elevate the status of some of these tools so that they reflect the important job they do for us. I was thinking about this when reading an article about Kevin Jorgeson and Tommy Caldwell who scaled the El Capitane in Yosemite National Park. Whereas we, as software engineers and the like, use our preferred tools, and blame then when things sometimes go wrong, the life of these guys depended on their tools. Heck, these guys used to sleep by hanging themselves (in a tent) off a cliff face. I think we’d all take more interest in our tools if our lives depended on it, right? So let’s stop blaming the tools for the stuff we do. Take a leaf out of the book of Kevin and Tommy and make sure, when you want a tool to do something (run a test, deploy some servers, build some code) think as if you’re life depended on that tool. Check, double check and even triple check that you have done things right. And if you don’t get the result you expect (a test failed, a server didn’t start, the build “broke”) at least you’re life did not depend on it. A bad work-person blames their tools!!! For my last post of 2014 I thought I’d share a retrospective technique than can be quite useful during the festive period. There are various version of this out there so this is my take on it – this technique works best with teams that have been working together for a while – several sprints. Don’t try this after your first sprint! The technique is based on the Dickens tale “A Christmas Carol“. On a whiteboard get the facilitator to write 3 columns with headings: “Christmas Past”, “Christmas Present”, Christmas “Future” (you can see where this is going!). This retrospective should focus on the project as a whole – from the start to where you are now. Then get the team to write down (on the ubiquitous “post it” notes) one thing that they either regret they’ve done on the project, or wish they could have done differently, or something that they would advise other teams to avoid or change. Remember this is across the whole project to date. These get put under “Christmas Past”. Discuss and prioritise – biggest impact/most helpful at the top – using your preferred method (voting stickers – 2 per person – work well). Then get the team to write one thing that someone else (in the team) has done (or continues to do) for them that they appreciated the most. This can be quite tricky for some but everyone should be able to recall some thing or event where another team member has helped them (“so and so was great at explaining technology X”, “thanks to Joe Bloggs for attending that meeting for me” – that kind of thing). The purpose of this is to engender the feel good factor in the team – a christmas “pat on the back”. If you are concerned that some people may miss out then the Scrum Master can often help (“a general thank you to the team” works). You don’t have to name names if you don’t want to – the compliments work fine if anonymised. Put these under “Christmas Present” and pat team members on the back/high five as appropriate. Finally get the team to write one thing they wish for in the future – for themselves, for the project or service, or for the team. Put these under “Christmas Future” and discuss/prioritise in the same way. The whole project viewpoint, coupled with a festive “feelgood” backdrop, should make this a memorable, and hopefully behaviour changing, retrospective. Best wishes for Christmas and a Happy and Prosperous New Year….